DCS has enhanced 3DCS software to handle many special case scenarios. To handle material thickness, for example, two methods would include using a Dynamic Point or Copy a Coordinate Point to reference thickness and then deviate the points with tolerances. 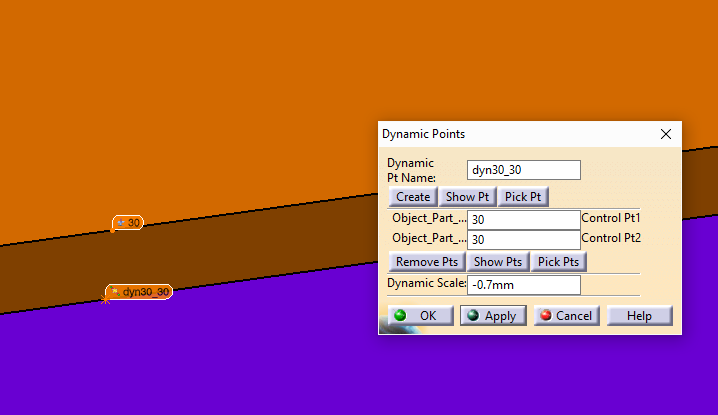 Here is a guide to setting up analysis of material thickness in 3DCS software. The Dynamic Point can be used as an offset point. 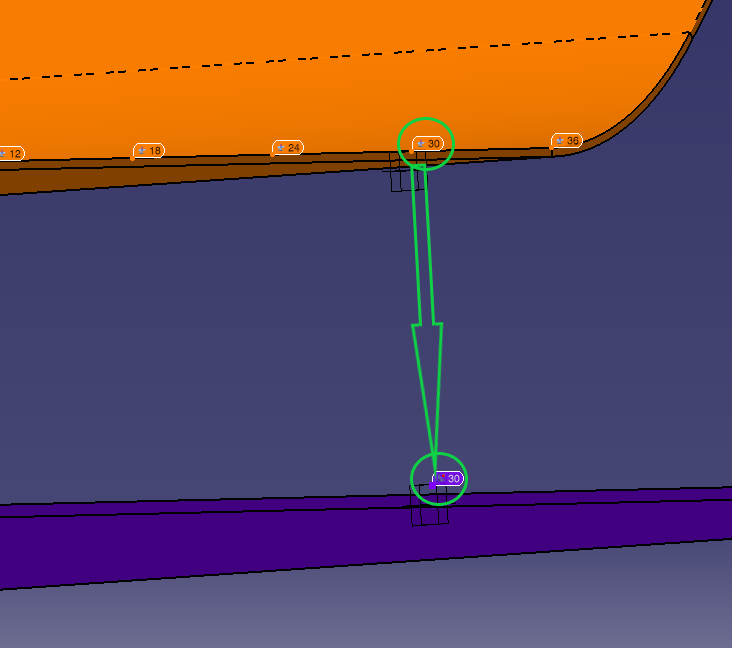 Tolerances will need to be applied to the Feature Point or the Coordinate (DCS) Point. Create a new Dynamic Point, selecting the point to represent an offset twice. Using the Dynamic Point as the Target point can be useful, as it will apply the tolerance variation to both the surface point and the Dynamic Point in the part, simulating the thickness. You can use this method to use the Dynamic Point as the Target Point in a move. You can still add tolerances to the surface or the Feature Point (Pt30), which will also cause the Dynamic Point to deviate with the surface tolerances. With this process, you’re basically taking the top surface point and copying that to the object part and using it as one of the locators in the move. You can use this method with your moves, to make the offset point (Object) to align to the target point. Then you can add tolerances to the Target point. Object Features: At least one object feature is required. Target Features: At least one target feature is required. First Value: Position Scale - Can be positive, negative, or zero. When Position Scale is zero, no action is taken for the position deviation. Second Value: Size Scale - Can be positive, negative, or zero. When Size Scale is zero, no action is taken for the size deviation. Third Value: Target Calculation Flag - Can be 0 or 1. Indicates whether the target position and size should be combined or not. If Target Calculation Flag is zero (default), the target positions and sizes are averaged and applied on the object features. If Target Calculation Flag is 1, the target positions and sizes are applied by pairing each target and object feature with the same index. The object feature position will be deviated by the target feature deviation with the Position-Scale if Position-Scale is non-zero. The object size will be deviated by the target feature size deviation with the Size-Scale if Size-Scale is non-zero. The routine only functions properly after the nominal build to get the correct target nominal positions and sizes. (1) When the target-calculation-flag is zero, the average values (position or size) are used. (2) When the target-calculation-flag is 1, the deviation of target position and size will be applied on the paired object feature with the same index. If an object feature or a target feature is not a feature-of-size, the size deviation will be ignored. Value 1 = 1: Can be positive, negative, or zero. When Position Scale is zero, no action is taken for the position deviation. Setting the option to 1 will set the tolerance type to Position. Value 2 = 0: Size Scale - Can be positive, negative, or zero. When Size Scale is zero, no action is taken for the size deviation. Setting to 0 will deactivate the option in the DLL to simulate the tolerance as Size. Value 3 = 1: Target Calculation - If Target Calculation Flag is 1, the target positions and sizes are applied by pairing each target and object feature with the same index. In summary, to simulate part thickness, there are a few ways to simulate this in a 3DCS model. Users can decide to use a DLL that will copy variation of points to another specific set of points or create and copy points to another part (not to a ghost part).